Anyway, to advertise the event, the Secret Garden devoted an entire window to the Hannah West books, creating a version of Fremont, the setting for Hannah West in the Center of the Universe. 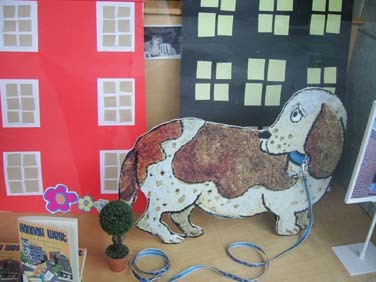 But the piece de resistance was the life-sized cardboard rendition of Elvis, the basset hound star of the book, complete with leash and ready to roll. (Sort of like a Dogzilla Hound, since he towers over the trees and buildings in the window.) My husband made the Cardboard Elvis, and let me tell you, it was ADORABLE. I wanted to keep it. But we gave it away at the book event. Elvis went home with a totally cool girl named Halley. I know he is in good hands and they’ll make a great duo. Elvis, the fictional basset, has the personality of Owen, my nonfiction basset hound. He’s a free-thinking love muffin of a dog, with a long wiggly body, jiggly epidermis, and the velvetiest ears you could ever pet. Owen was a little apprehensive when he met Cardboard Elvis, but he is always a friendly guy, so he went over to give the sniffing greeting. Alas, Cardboard Elvis lacked the distinct hound aroma. I’m hoping to make more Cardboard Elvises to have as giveaways at book events this spring and summer. Oh, I love that cardboard Elvis! I wish I could have been at your book event to scratch Owen’s velvety ears . . .